PUBLISHED: Yes WHERE: Problems of Neurosurgery named after N.N. Burdenko. Moskow. 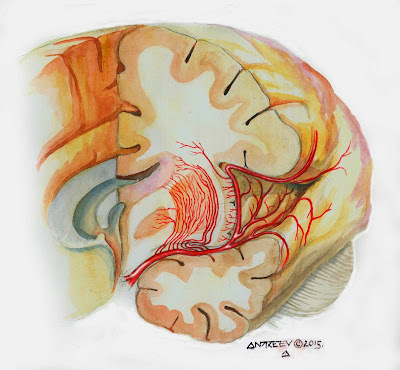 DESCRIPTION: Branches of the middle cerebral artery of small diameter penetrate through the central and lateral part of the anterior perforated substance. They called lentikulostriarnye. These arteries are the medial and lateral. Medial arteries blood supply: the head of the caudate nucleus, the medial portion of the Central shell, lateral segment of the globus pallidus, the front part of the thigh of the internal capsule and the anterior-posterior upper part of the thigh. Lateral arteries blood supply: the upper part of the head of the caudate nucleus and anterior thigh internal capsule, most of the shell of the lateral segment of the globus pallidus, the upper part of the genu of internal capsule and hip rear of the internal capsule with an adjacent part of the radiant crown.